I racked up a significant amount of debt in my early twenties. I had Bee when I was just 17, and had gone off to university at 19, with a toddler to take care of. I say ‘gone off’, I didn’t actually go anywhere – I needed to be near my Mum and my Gran to help with the childcare, so I lived in Somerset, and commuted every day to lectures in Bristol. As you can imagine, this wasn’t cheap. You didn’t have to pay fees back then, but I did have to support a whole household, albeit a small one, and find the money somewhere for all that petrol. It’s no surprise then that I came out the other end of it a little the worse for wear financially. Initially I didn’t deal with it well. I was scared I think, scared about the future, about how I was going to manage it. It might sound childish, but I was also scared of getting told off – I was still pretty young and the idea of calling up a company to tell them I couldn’t afford to pay them back right now was terrifying. For a while then, I buried my head in the sand and tried to avoid it, but the trouble with debt is that it doesn’t go away. If you ignore it, it just gets bigger and uglier. You can’t escape. Eventually I realised this, and took steps to get everything in order. It wasn’t easy, and it wasn’t quick, but for at least the last ten years I’ve had an unblemished credit record, and that is massively important to me. The feeling of facing up to my debt and getting it sorted was incredibly satisfying and went a long way to helping me make that shift from the teenage student mentality, to being a responsible adult. This is the absolute crux of the thing. If you are worried at all about how you’re managing your debt, do not ignore it and hope it will go away, because it won’t. Nobody wants a final demand notice landing on their doormat, but hiding it at the bottom of a pile of paperwork is not going to help. Once you’ve plucked up the courage to open all of those bills, book some time to properly sort through everything and work out what you owe. Just knowing the facts will help you feel more in control, even if there isn’t immediately a light at the end of the tunnel. Once you’ve worked out exactly what you owe, compare it to how much disposable income you have and make a realistic plan for how much you can put towards paying off your debt every month. While you’re doing this, have a look at your other outgoings – are there any cuts to non-essentials that you could make, just while you get back on track? Think unwanted gym memberships, Netflix subscriptions, nights out, take away coffees – every little helps. If you’re feeling overwhelmed by your debt, and like you really can’t cope with it on your own, then talk to someone. It might be that just talking to a friend or family member helps to ease the anxiety, or you might want to get some advice from a professional service. The Money Advice Service has details of different debt charities and helplines. Hiding debt from a partner can be particularly stressful, so it’s important to be honest about your situation, for your sake and for your relationship. You’ll find that most companies can be flexible – the important thing to them is that you keep in touch and are honest about your circumstances. The worst outcome for them is that you disappear, so if you call them with a breakdown of your situation and an offer to pay them back at an amount you can afford, until circumstances change, you’ll be surprised at how happy they’ll be. You’ll hear a lot of people talk about credit card balance transfers and this is definitely something to consider if your credit is still decent. TSB for example has a couple of really good offers at the moment, including 0% on balance transfers for 28 months or card with a 0.25% transfer fee. Shop around and you could save a lot. This is a good option for people who prefer to have one fixed amount to pay off every month and makes sense if you have a lot of small, expensive debts like store cards. Make sure you do the sums and get a good rate – you don’t want to end up paying back more than if you kept things separate. Sounds obvious, but you’d be surprised at how easy it is to just pop a little something on a credit card. If you do switch a balance, cancel the old account so you’re not tempted just to add more purchases to that one. If you consolidate store card debts, get rid of the store cards. I know you’d rather spend your evenings relaxing on the sofa and watching TV, but let’s be sensible – sometimes the only way to clear a debt is to knuckle down and earn some extra money. It doesn’t have to be forever, but don’t you want that day when you’re debt free to come round as quickly as possible? A second job doesn’t have to mean night shifts in McDonalds, there are lots of way to earn money from home that aren’t too hideous. Getting free of debt is important, but there’s no point making a plan that means that every free penny goes to pay off your debts for the next five years, because you just won’t stick to it. It’s like dieting – ban all the fun foods completely and you end up binging. Instead, include a few fun things in your budget. No one expects you to live like a monk – it’s much better to factor in the odd treat and stick to your plan than be a complete martyr about it and set yourself up for failure. Because birthdays and Christmas are really expensive. Plus everyone loves a handmade gift right? Have you ever struggled with debt or money management? 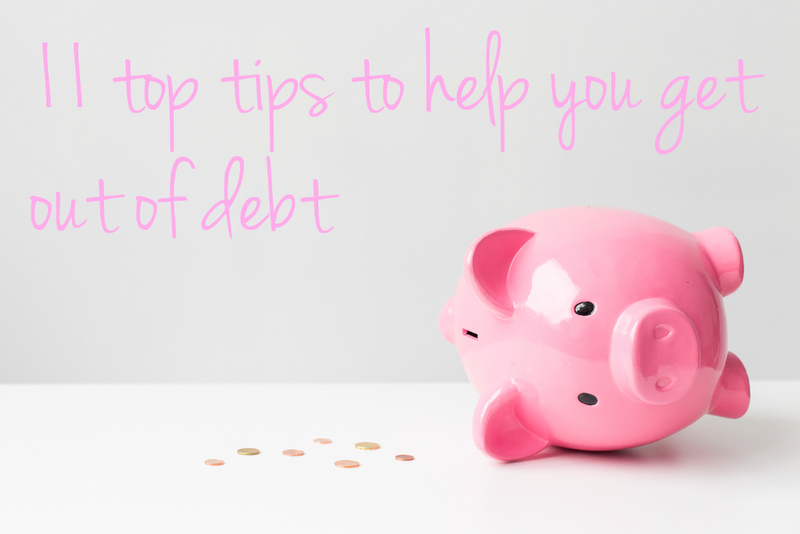 What are your top tips to help get out of debt? Image credit – piggy bank: Kaspars Grinvalds/shutterstock. Sponsored post. I had a period of clearing debt and found the audit you do on Moneysavingexpert.com invaluable, as well as posting it anonymously for others to rip apart., It’s tough to be told “how can you afford a cleaner when you’ve got debt” but then you just have to justify the expenses you want/need to make (with young kids we’d go insane and have no time with them and would rather a clean house and save elsewhere). Just reviewing all your utilities, sky, phone, etc etc cuts a lot of overhead. And then flog whatever you can on ebay. Challenge yourself to the off no spend day. Final tip is don’t beat yourself up – there is a real mental health to debt link and you need to stay realistic. You won’t solve it overnight, there will be speed bumps, you must have some treats – but you can get debt free. These are great tips for getting out of debt! Balance transfers can really come in handy in helping get rid of your debt if your current card offers transfers and also currently have an high interest rate. Thanks for sharing!